Jill Briscoe’s words, “Go where you’re sent, stay where you’re put and give what you’ve got,” have great meaning to me. Many years ago, my three kids and I volunteered to prepare and serve dinner every Tuesday night at our church. Each week our team served hundreds of meals in a little over an hour. Though there were many people in line, I learned that when I focused on the one person in front of me instead of the long line, people actually were served more quickly. As I reflected on why I served, Eric Liddell’s quote helped me frame this first lesson. “I believe God made me for a purpose, but he also made me fast! And when I run I feel his pleasure.” I sensed God’s pleasure and delight when I gave what I’ve got. As God guided my giving and serving journey, I began to serve in a wide range of differing ministries, not realizing that it was all preparation for co-founding Chronic Joy Ministry. The next important lesson was willingness. I was asked to share my testimony at church and it included that willingness is all I have to give. But I hadn’t yet realized that willingness is all God asks from us. He equips and provides as we “give what we’ve got.” Eventually, I understood that willingness is an act of obedience that speaks love to the Father. Over the years, I’ve met many missionaries who serve and live in exotic and far-away places. I thought this was a prerequisite for the title “missionary.” Yet Jill Briscoe has also said, “Your mission field is the ground beneath your own two feet.” I began to understand that we are all missionaries. Being called to stay or go, and to give what you’ve got has been transformative as chronic illness has grown to be my constant companion. Today, I can no longer give in the ways I’ve given in the past. Yet I’ve discovered that there are new ways to give what I’ve got, and they are no less important or valuable. They are just different. I am now a missionary who goes where I’m sent. Some of my doctor’s appointments qualify as “travel to distant and foreign lands.” How I interact with others in the waiting room, with the receptionist, nurses and even with my the doctors are opportunities for my faith to shine. When I call the insurance company from home, which is where I spend most of my time – staying where I am put, to resolve a problem, I have the opportunity to invite the Holy Spirit to shine. Not long ago, I actually received a thank you note from an insurance rep. for the kindness I showed as we worked to resolve a significant issue. Her handwritten note, said that she rarely receives kindness from those who call. Ouch! I wondered if that might have been me in the past. Today, I am a missionary representing God in everything I do. As I offer my willingness, God opens my eyes to things that have always been there, but that I’ve never noticed. Recently, I noticed that there is no easy way to return grocery carts from the handicapped parking spaces. Some days those extra steps back into the store are almost too much for me. Now when I spot a cart left in the parking lot, whenever possible, I take into the store with me. It’s a small thing, but it’s somewhere I can give what I’ve got. God often invites us, but without willingness, we miss the blessing. This past Saturday, I needed help completing a ministry event project. It was more than I could do on my own, so invited my newly married daughter and her husband to help me. As the three of us and my husband sat at the table, I remembered how we used to serve as a family all those years ago. That evening, many hands made light work, and it reminded me of Matthew 18:20, “For where two or three gather in my name, there I am with them.” The moment was both powerful and beautiful. Yet none of it would have happened without God’s invitation to link arms and serve together wherever and however we can. Together has been an important word as I’ve invested my time in the ministry of Chronic Joy for the past almost three years. 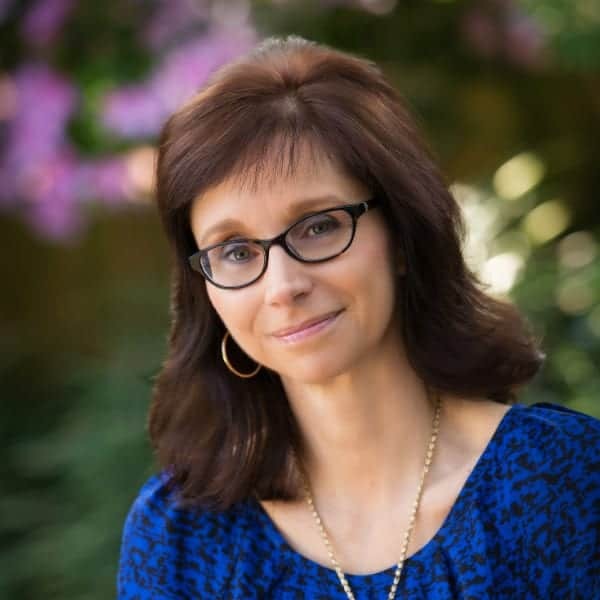 Each day is filled with much learning for both my ministry partner, Cindee, and me – much leaning and pressing into the Father as He builds this ministry brick-by-brick, and we sense His pleasure as we give whatever we’ve got. #GivingTuesday has become an international day of linking arms and impacting the world together in simple ways that make a big difference. Today, I have the privilege of inviting you into the mission of Chronic Joy, where together, we can sow seeds of hope, purpose, worth and joy. It it’s overwhelming for me to grasp how much needs to be done and how much God has asked of two women with significant chronic illness. But I have learned that He is the one who leads this ministry and who faithfully cares for every detail. Why do I serve full-time without a paycheck? I have been invited into work matters that matters to God. The work we do changes lives, offering hope to those who feel isolated and alone – like I do. Though I devote hours to serving and loving on those affected by chronic illness, I have the blessing of doing it all from home, staying where I’m put. In my office is a recliner loveseat. On days when I feel very unwell, I curl up on couch under an electric throw – a refuge to rest and pray for those we serve, for those we hope to serve. Chronic Joy’s logo hanging on the wall, the one my husband lovingly made for me, reminds me that I was invited to wholeheartedly serve – time, space, mistakes, learning, gifts, talents and my husbands hard-earned money. I really do sense God’s pleasure and delight as I give what I’ve got – by loving God and loving others. But my husband is the real hero of this giving story. He heeds God’s call where its hardest – financially. With my constant medical bills and providing for our daily needs, he also cheerfully gives each month to Chronic Joy, both financially and through service. My husband makes sure I take care of myself, something I’m not always very good at, and he quietly works behind the scenes, dropping packages off at the post office, emptying the dishwasher, and a thousand other things, all after a long day of work. He drives me to most of my doctor’s appointments and cringes each time a new medication is added. He feels helpless to “fix” my many illnesses and that is truly where he shines, as he quietly listens while I struggle with whatever is challenging me. And he generously provides me time and space to do the work God has called me to do. Learning to be generous with what I have is an ongoing lesson in surrender and trust. Surrender was my word for 2017, when I learned that surrender wasn’t waving a white flag and giving up. Living the surrendered life is actually learning to be more of who God called me to be. It’s living as a whole person, inhaling the great exhale of God and turning around to love God and others with my whole broken and unwell self. This year my word is joy. I wondered how surrender could be followed by joy, but it absolutely can. In fact, it does. As I’ve learned to press into and trust God, He has invited me to serve with Him. Most of prayers have included, “Lord, You are invited into my day. Lead me, guide me, and help me to show You that I love You through my obedience.” He has been faithful and that’s where joy is found – in serving with and giving whatever I have. Serving with Chronic Joy means focusing on one precious life at a time, and that includes me. God has sown the precious life-giving seeds of Hope, Purpose, Worth and Joy in me, so I can extend the invitation to you. Will you join me in giving what you’ve got? One of my great joys this year was receiving an email “requesting a partnership” from Salome in Kenya, who is loving on the suffering in her country and who needed gifts we could give. I am so grateful God invited me to co-found this ministry. Before Chronic Joy, we could find few resources or Bible studies, little encouragement or hope, and no community. Today, we extend hope and encouragement every day, we offer a warm welcome to each precious life affected by chronic illness, and we’ve developed resources to make the journey a little easier. #GivingTuesday is November 27! I’m asking our entire Chronic Joy community to consider making a gift this year. Would you consider how you might give what you’ve got? Every gift makes a HUGE difference! And all funds raised go directly to the mission and ministry of Chronic Joy – to sowing seeds of Hope, Purpose, Worth and Joy in the lives of those affected by chronic physical and mental illness. By donating to Chronic Joy on #GivingTuesday, you’ll ensure that people around the world have faith-based educational resources at their fingertips, daily encouragement and inspiration, hope-filled Bible studies, and that there is a place for those who are searching to find radical hope and compassionate change as they discover Chronic Joy Ministry. Chronic Joy is each of us being missionaries – going where we’re sent, staying where we’re put, and giving what we’ve got. I’m excited to see what God will do as together we link arms on this amazing journey! Thank you so much for being obedient to God’s calling, Pamela. 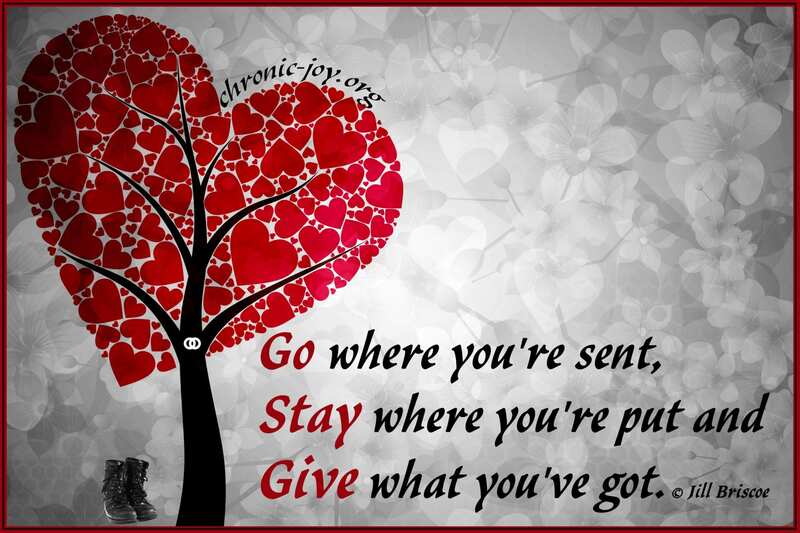 You and Cindee and the entire board & team at Chronic-Joy are true blessings to so many of us on this Chronic Illness Journey. I am linking back here for Giving-Tuesday from my blog this week. May the Lord supply and provide for all that you need here. Thank you, Bettie. You are such a gift to us!